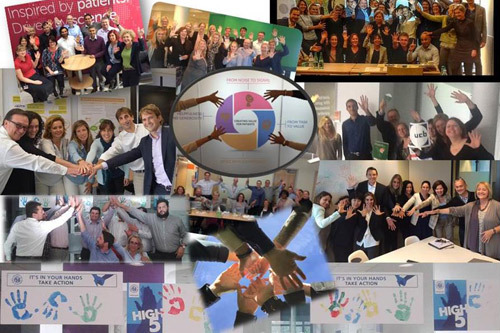 Staff at Brussels-headquartered biopharmaceutical firm UCB are backing World Arthritis Day's #High5 social media campaign. World Arthritis Day (WAD) is a global initiative bringing people together to raise awareness of issues affecting those with rheumatic and musculoskeletal diseases (RMDs). A quarter of people in the European Union - more than 120 million - are affected by these diseases. This year's theme is 'It's In Your Hands. Take Action'. WAD organisers are encouraging people all over the world to spread awareness on social media with the hashtag WAD #High5. Participants have been asked to write - on their hand - the first name of someone they know suffering from RMDs, and to photograph it in a 'high five position' and share the photo on social media. Employees across UCB's facilities have taken #High5 photos to support WAD. This year the immunology team in particular was involved with WAD, holding a series of fundraising and disease awareness events. As well as the fund-raising activities, UCB employees focused on WAD as an educational day. In the UK National Rheumatoid Arthritis Society (NRAS) director of development, Tracey Hancock, took part in a recent 'Lunch and Learn' event, along with the charity's CEO and founder, Ailsa Bosworth, who is also a rheumatoid arthritis patient, a UCB spokesperson told PMLiVE. Rheumatic and musculoskeletal diseases affect a quarter of all people in the European Union - over 120 million - and it's thought that almost every family in Europe is affected by RMDs in some way.